The Golden Girls actresses all had a body work prior to the very popular Susan Harris-created show. A veteran of Broadway, Bea Arthur had starred in specials and her own sitcom entitled Maude. Betty White had starred on several series including The Mary Tyler Moore Show as the happy homemaker Sue Ann Nivens. Rue McClanahan started on soap Another World and went on to appear on sitcoms Maude and Mama’s Family. Estelle Getty was primarily known for stagework but thankfully the others were captured on film and tape. Here’s a small and very eclectic sampling. A 1972 clip from The Odd Couple guest-starring Betty and her now-deceased husband Allan Ludden. Betty White with Michael Jackson in The Jacksons Show from 1977. How often do you see these two together? A clip from the late 1970s Donny & Marie variety show featuring Betty and Paul Lynde. 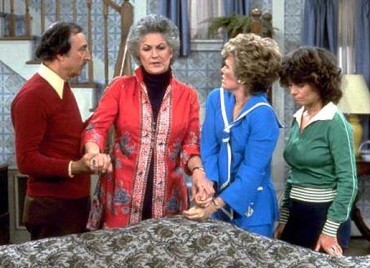 It was because of this episode of All in the Family that Bea Arthur was given her own show Maude. Rue McClanahan & Bea worked together on the Norman Lear-created sitcom Maude which ran from 1972-78. Bea played a bar owner and singer in the in-famous Star Wars Holiday Special in 1978. Watch at your own peril. Bea talking with Wayland Flowers’ Madame on The Beatrice Arthur Special in 1980. Rock Hudson was also a guest. Rue appeared with Betty just prior to The Golden Girls on The Carol Burnett Show’s spin-off series Mama’s Family. The Golden Girls: Rue McClanahan Dies at 76; Goodnight Blanche. This show and others they appeared on was absolutely amazing. I was glued to the tv screen daily. I loved the shows.